Already a bit after CW38... but still something that I was planning to post during the last weekend. Today a small Robot by José Pino, mostly made of LEGO. 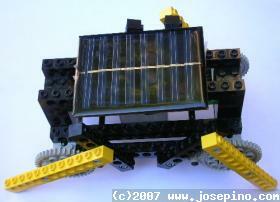 I said mostly but it could have completely made of LEGO if he had choosen to use the LEGO Education solar panel (9912). This is a 4-legged walking robot driven just by a solar panel, a motor and gears (no RCX, nor NXT were used). By reading some of the author's articles about this creation, you will understand how it works but also the difficulties and successes achieved across a few versions [1, 2, 3, 4].